Createspace Independent Publishing Platform, 9781451587814, 74pp. Comic books and philosophy don't usually mix, but during her "drawn out" college career, Kristen Caven often used cartooning to medicate "the pain in her brain." In her new collection of full-page works, she has danced around the edge of the autobiographical comic genre, and may have just opened up new territories in sequential art. Seven short stories explore themes like rocks, feet, animals, road trips, romance and love, unfolding in a journey of discovery around the centerpiece of a 30-page graphic novel about a college student on a quest to find her own beliefs. Free-thinking friends blow her mind with discussions of philosophy, language, war, isms, and disappearing cows. The various quirky and academic graphic stories deal with the scientific process, eastern/western world views, humanism, existential crises, lit-crit, post-modernism, dualism, feminism, alcoholism, pop culture, dreams, and cosmic consciousness. Each are introduced by short personal essays in which the author shares her adventures with the craft, her life, and building a personal philosophy by understanding the ideas of others. 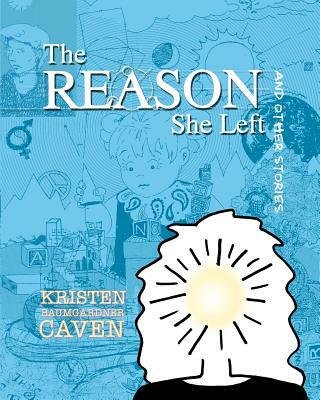 The Reason She Left and Other Stories is the follow-up to Caven's memoir, Perfectly Revolting: My Glamorous Cartooning Career. Kristen Baumgardner Caven has worked as an explorer of ideas and perception in a variety of forms. She is "drawn to story," though she also values one-liners and images layered with meaning. In addition to her memoir, Caven has co-written and illustrated several books with author Louise Hart. Her novelty items are available at www.littlepig.com.